The Epson TM-H2000 offers the functionality that most retailers need. With its high-speed receipt and graphics printing and fast check processing technology, the TM-H2000 increases productivity and keeps customer lines moving. Epson's TM-H2000 features a MICR that not only has an industry-leading 99.9% accuracy, but also reads more of the check area to ensure even poorly positioned MICR lines are read. All of this means increased productivity and fewer unreadable checks. With print speeds up to 260 mm/second, the TM-H2000 features fast receipt printing and prints both text and graphics at the same high speed. 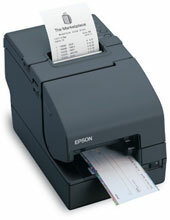 The Epson C31CB26A9951 is also known as Epson POS Products	C31CB26A9951	.